Luxury buyers pay big money for the right to be exclusive, which is why Maserati's 2015 Quattroporte performance sedan is so attractive. From its Ferrari-built V6 and V8 engines to its stunning Italian appointments, the Quattroporte makes a statement even when standing still. Those seeking a high level of luxury, performance and styling with the added caveat that it must also be exclusive will find much to love in the 2015 Maserati Quattroporte sedan. Unless you live abroad, we promise you won't find a sea of similar cars in the Neiman-Marcus parking lot. Those seeking the latest in high-tech driver assist and infotainment features won't be pleased with what the Quattroporte has to offer. A better choice might include the Mercedes-Benz S-Class, Audi A8, BMW 7 Series or Lexus LS. Changes for Maserati's 2015 Quattroporte luxury performance sedan are mostly cosmetic. On the S Q4, last year's power-adjustable foot pedals are now optional, while a Wi-Fi hotspot is made standard. New options include red leather seating, new 19- and 20-inch wheels and new paint and interior color choices. The Quattroporte cabin is a sublime blend of leather, wood, chrome and optional carbon-fiber accents. The Maserati Trident is seemingly everywhere, from the middle of the steering wheel to center of the oval analog clock. In addition to analog gauges, the Maserati Quattroporte for 2015 has a 7-inch TFT display in the instrument cluster and an 8.5-inch in-dash touch screen. The car can be fitted with a heated wood steering wheel, and the rear seating area can be configured to carry two or three passengers. As a result of last year's lengthened wheelbase, rear-seat legroom is now ample. The 2015 Quattroporte by Maserati has strong curb appeal in its distinctive design that showcases a ribbed grille dominated by the traditional Maserati Trident logo and the automaker's signature three chrome portholes on each front fender. Flowing lines accentuate the car's extended wheelbase and overall length. While there is a significant price difference between the GTS and S Q4, the two cars are indistinguishable except for the badging and exhaust-tip treatments - the V8 GTS has a twin-trapezoid design versus the V6 S Q4's twin-round outlets. Maserati's 2015 Quattroporte is a substantial sedan in both length and weight. Thankfully, a pair of powerful engines, capable adaptive suspension and excellent Brembo brakes congeal to make the big Q ride and handle like a much smaller car. We applaud Maserati for sticking with conventional hydraulic steering assist, which delivers fantastic feel and responsiveness. There is a distinct performance difference between the two trims, although both the S Q4 and GTS display a smooth, comfortable ride under normal driving conditions. The all-wheel-drive S Q4 has its power biased toward the rear wheels and only changes when wheel slip is detected. With its twin-turbo V6 humming under the hood, the S Q4 feels strong, balanced and responsive, but it's the Ferrari-sourced twin-turbo V8 in the GTS that really makes the Quattroporte a contender. Powered by its rear wheels only, the GTS is the choice for hard-charging drivers. The 2015 Maserati Quattroporte S Q4 has a Manufacturer's Suggested Retail Price (MSRP) starting at $108,700, but can easily be pushed past the $120,000 mark by adding options. The top-line Quattroporte GTS has a loftier $143,600 base price and fewer options as a result, but when equipped in the 4-passenger configuration with perforated leather, rear tables and the optional Bowers & Wilkins sound system, it can easily top $160,000. These prices are squarely in the realm of the top-level Mercedes S-Class, BMW 7 Series, Jaguar XJ and Audi A8 sedans, and well above what a loaded Lexus LS 460 costs. Check the KBB.com Fair Purchase Price to see what folks in your area are paying for the Maserati Quattroporte. While it's true buyers are paying for the Maserati element of exclusivity, don't look for the Quattroporte to hold its value as well as its German and Japanese rivals. The 2015 Maserati Quattroporte features a choice of two twin-turbocharged powerplants, a 3.8-liter V8 in the GTS and a 3.0-liter V6 in the S Q4. Both sedans have the kind of throaty exhaust note and responsive performance that you'd expect from an Italian exotic. While incorporating Maserati engineering and design, both engines are actually manufactured by Ferrari. An 8-speed ZF automatic transmission channels engine power to the rear wheels of the Quattroporte GTS and to all four wheels of the Quattroporte S Q4. The Italians just have a knack for creating fine art, which is why it comes as no surprise that the 2015 Maserati Quattroporte luxury sedan is one of the most stunning high-end European 4-doors money can buy. A throaty exhaust and aggressive front end dispose of the notion that this sedan is only for the pampered. 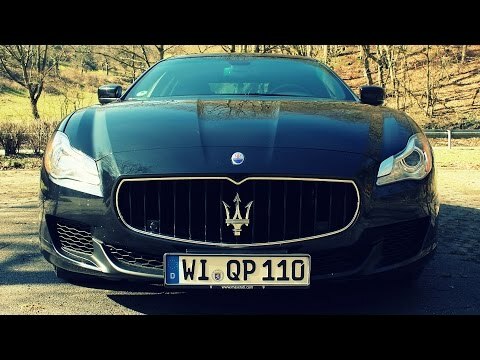 Indeed, the Quattroporte in GTS trim can dash to 60 mph in a mere 4.6 seconds, and while that isn't as quick as a Mercedes-Benz S63 AMG it's nothing to sneeze at. The Quattroporte for the 2015 isn't as technically advanced as an Audi A8, but there is an Old World craftsmanship about this car that sometimes seems absent with other mass-produced luxury models.